After trumpets of the apocalypse proclaim the fall of humanity, vampires arise from the shadows to rule the earth. Yuichiro wants just one thing-to get revenge by killing each and every vampire. 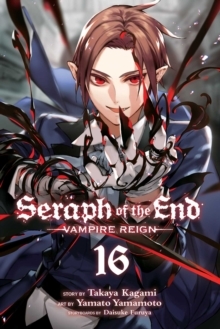 The battle to save Ferid and Krul Tepes from Ky Luc and the vampires begins in full force, but victory isn't going to be easy. Ky Luc is a Fifth Progenitor and it'll take a lot of coordination and teamwork to take him down. But Shinoa Squad and Guren have a plan-use the Seraph inside Yuichiro to overwhelm the vampire! But can Yuichiro keep himself in control of it long enough to defeat Ky Luc? !